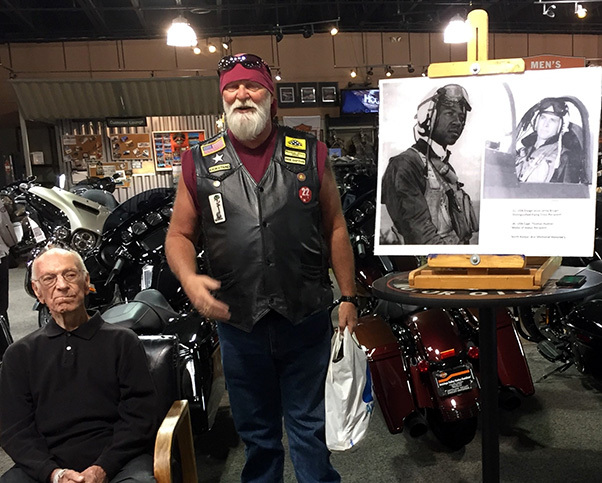 On June 16, he survived another distinction and honor, being inducted as an honorary member of the Patriot Guard Riders at the Antelope Valley Harley-Davidson dealership. “I cannot tell you how pleased I am to be with you, and that comes from the heart,” PGR Ride Captain Jim “Kick Stand” Jacobs, an Army veteran, said. “Bomber” Bob Wood, left, with Patriot Guard Riders Capt. Jim Jacobs at the Lancaster Harley Davidson. 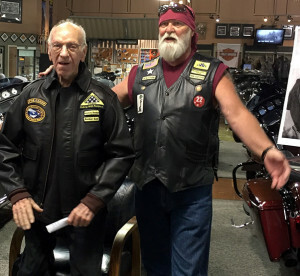 On June 16, Wood was inducted as an honorary member of Patriot Guard Riders. The Patriot Guard riders are the association of motorcyclists who formed initially more than a dozen years ago to safeguard the funerals of deceased servicemen and women whose memorials were the subject of protests by extremist groups. In more recent years, PGR’s mission has expanded to funerals for active service, and veterans, and supporting the troops. Robert “Bomber Bob” Wood “is our oldest member, and I really don’t know if he adopted us, or we adopted him,” Jacobs said. In addition to recognition of Wood’s pilot skills and intrepid service while flying 35 bombing missions, Wood is also renowned as a rocket scientist engaged in development of the Thor ballistic missile during his Cold War-era work in the 1960s at Edwards. Wood joined the U.S. Army in February 1940 and was sent to U.S. Army Air Corps training in Fort Lewis, Wash. After pilot training in 1941, Wood’s entire Army Air Corps division was invited to integrate with the War Department’s new branch of service, the U.S. Army Air Force. The Air Force became an independent branch by order of President Harry Truman in 1947. Wood was surrounded by about two dozen members of the Patriot Guard Riders chapter, including David Corbin, Coast Guard; Lino Torres, Marine; and Gary Chapman, Army and Vietnam War veteran. Wood was accompanied by his friend, retired sea captain Ed Sullivan, who served with the Sea Lift Command during the Vietnam War. “Bomber” Bob Wood, left, with Patriot Guard Riders Capt. Jim Jacobs alongside a photograph of Medal of Honor winner U.S. Navy Ens. Jesse Leroy Brown. 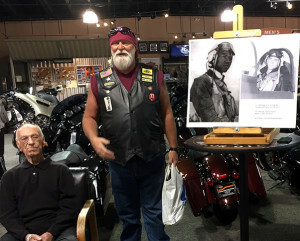 The June 16 event was also the launch of a drive to build a memorial for a pair of distinguished Korean War-era naval aviatiors – Brown and Capt. Tom Hudner. 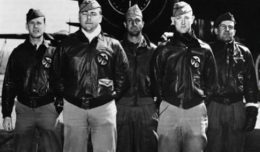 Sullivan said the occasion was also convened to announce the launch of a drive to build a memorial for a pair of distinguished Navy aviators from the Korean War. Ens. Jesse Leroy Brown, posthumously awarded the Distinguished Flying Cross, was killed Dec. 4, 1950, after the carrier-based Corsair he was flying was hit by enemy ground fire and crash-landed during a patrol sweep in support of troops fighting at the Chosin Reservoir. Defying his superiors, Capt. Tom Hudner, crash-landed his Corsair in an effort to rescue his comrade. Brown was the first African-American naval aviator. For his effort to rescue Brown, Hudner was awarded the Medal of Honor. Hudner was rescued and survived. “President Truman recognized Hudner’s action as a way to try and bridge the racial divide,” Sullivan said. Sullivan said a veterans alliance is enlisting the help of House Majority Leader Kevin McCarthy is an effort to build the memorial. He thanked the Patriot Guard Riders for their recognition of Wood, and support for the memorial initiative. After Saturday morning’s ceremony, the Patriot Guard Riders mounted their iron horses and rode to a barbecue hosted by Wood where he took an opportunity to show them his 1949 Cadillac, not a Harley-Davidson, but certainly, a rare ride. The Cadillac had belonged to Charles “Charlie” Wilson, the General Motors chairman who went on to become President Dwight D. Eisenhower’s Secretary of Defense.